After the 20th century, that was considered the century of Electronics, the 21st century is the century of Photonics. In 1960, Theodore Maimam built the first apparatus using the principle of "Llight Amplification by Simulated Emission of Radiation". A principle that allows light to be generated with power debsities billions of times higher than the highest conventionally produced power or energy densities. Since than, the LASER has had an Characteristics of Optical Radiation unprecedented success story in technology. Electromagnetic radiation is found as a natural phenomenon in almost all areas of daily life. Some examples are thermal radiation (in the form of warmth), x-rays and γ-rays emerging from radioactive decomposition. Electromagnetic radiation is also artificially generated by radio transmitters or mobile phones. It travels in waves like sound and is produced by the movement of charged particles. In contrast to sound, electromagnetic radiation does not need a medium in which to travel. Laser radiation – like all light – consists of electromagnetic radiation as well. 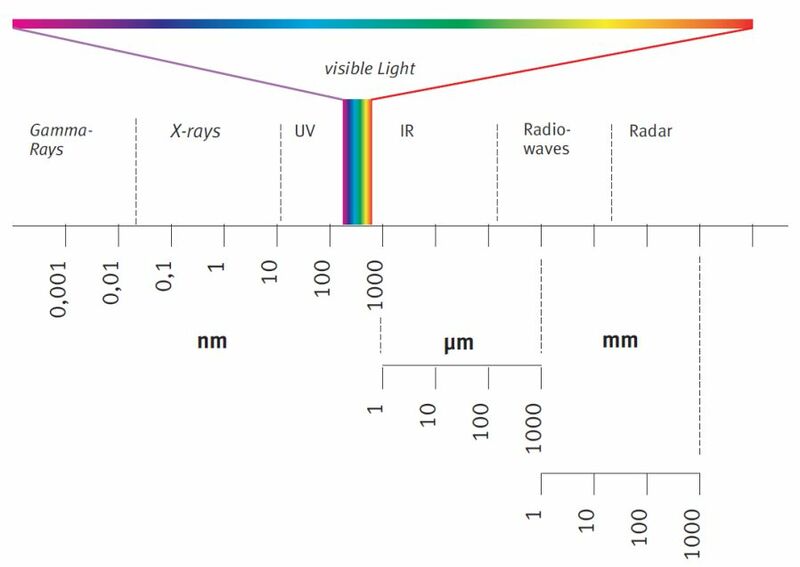 Electromagnetic radiation within the range visible to the human eye is commonly called light. In this general sense light consists of electromagnetic radiation in the wavelength range between 380 and 780 nm (nm = nanometer = one billionth of a meter). This range is designated as the visible spectrum. When all wavelengths in the visible spectrum are emitted simultaneously, this is perceived as white light. When white light falls on an optically dispersive element such as a prism or birefringent filter the colours of the spectrum can be seen due to refraction. It starts at the short wave as the colour violet, turning to blue, green, than yellow and goes to the long wave, which appears as red. Beyond the long wave (red) of the spectrum is the near and far infrared range. Below the shortwave range (blue) is the ultraviolet range. To start the laser activity the atoms of the laser medium have to be stimulated by the pum-ping process. The electrons of the atoms are elevated to energetically higher levels. Falling back to a lower level they emit their energy in form of a photon which is the smallest energy quantum of electromagnetic radiation. These photons in turn stimulate other atoms. The amount of light is being continually increased in intensity as it oscillates back and forth be-tween the mirrors, creating an avalanche effect. A certain part of the photons pass through the partially reflecting/partially transmitting mirror and forms the laser beam. Lasers differ not only with respect to wavelength or optical power from each other, but also in the way how the power is emitted. It is a relevant difference, if the power is emitted continuously (continuous wave operation - cw) or in form of pulses (long pulse, giant pulse / q-switched or mode-locked). In case of pulsed operation with low pulse repetition rate the peak power of each single pulse is the critical value. If the repetition rate inceases, the avarage power needs to be taken more and more into consideration. Please note, that some lasers can be operated in different modes. Lasers have been categorized into 4 hazard classes based on the accessible emission limits or AELs. These limits indicate the class of the laser and are listed in EN 60825-1 and the American National Standards ANSI Z136.1 for Safe Use of Lasers. The AEL values for the laser classes are derived from the medical MPE (Maximum permissible exposure) values. The MPE values specify the danger level for the eye or the skin with respect to laser radiation. Since 2007 the laser classes are defined as listed below.